French experts give an in-depth report on bin Laden’s financial network to a senior FBI official, according to a source close to French intelligence. A month later, the FBI official admits to his French colleagues that the document still hasn’t been translated into English. [Los Angeles Times, 10/14/2001] It is not known what the FBI does with the report after that, if anything. For access to the complete 911 Timeline (as well as research results on other, non-911 topics) please visit "Cooperative Research". 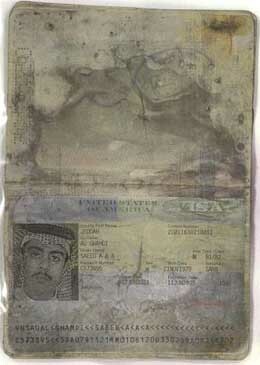 The recovered passports are really incredible. Most people are aware that one passport was supposed to have been found, which is hard enough to swallow, but four beggars belief! Brad Johnson on Fri, 11/03/2006 - 9:34pm. They really expect us to believe this?!? Tonya on Fri, 11/03/2006 - 10:01pm. in Pennsylvania in such pristine condition!!! Imposible!!! It was used as evidence in the 2006 trial of Zaccharias Moussai. Anonymous (not verified) on Sat, 11/04/2006 - 12:28am. Anonymous (not verified) on Sat, 11/04/2006 - 12:29am.